As the news broke on March 7, 2016, that US drone strikes had killed 150 people in Somalia, the White House announced it will reveal, for the first time, the number of people killed by drones and manned airstrikes « outside areas of active hostilities » since 2009. The tallies will include civilian deaths. This is a critical first step toward much-needed transparency. But it will not go far enough. In May 2013, responding to international criticism about his drone policy, Obama delivered a speech at the National Defense University. He proclaimed, « America does not take strikes when we have the ability to capture individual terrorists — our preference is always to detain, interrogate and prosecute them. » Then why has Obama added only one man to the Guantánamo roster? As he gave his 2013 speech, the White House released a fact sheet that purported to contain preconditions for the use of lethal force « outside areas of active hostilities. » But the Presidential Policy Guidance, on which the fact sheet was based, remains classified. – There must be a « legal basis » for the use of lethal force. It does not define whether « legal basis » means complying with ratified treaties. They include the UN Charter, which prohibits the use of military force except in self-defense or when approved by the UN Security Council; the Geneva Conventions, which prohibit the targeting of civilians; and the International Covenant on Civil and Political Rights, which guarantees due process and the right to life. – The target must pose a « continuing, imminent threat to US persons. » The fact sheet does not define « continuing » or « imminent. » But a US Department of Justice white paper leaked in 2013 says that a US citizen can be killed even when there is no « clear evidence that a specific attack on US persons and interests will take place in the immediate future. » Presumably the administration sets an even lower bar for non-citizens. – There must be « near certainty that the terrorist target is present. » The fact sheet does not address « signature strikes » (known as crowd killings), which don’t target individuals but rather areas of suspicious activity. – There must be « an assessment that capture is not feasible at the time of the operation. » It is unclear what feasibility means. It was feasible to capture Osama bin Laden, as none of the men at the compound were armed at the time the US military assassinated him. – There must be « an assessment that relevant governmental authorities in the country where action is contemplated cannot or will not effectively address the threat to US persons, » which is left undefined. – There must be « an assessment that no other reasonable alternatives exist to address the threat to US persons, » also left undefined. In February 2016, the bipartisan Stimson Task Force on US Drone Policy gave the Obama administration an « F » in three areas the task force had flagged for improvement in its June 2014 report. The first area is focused on progress in releasing information on drone strikes. The second involves explaining the legal basis under US and international law for the drone program. The third is about developing more robust oversight and accountability mechanisms for targeted strikes outside of traditional battlefields. Speaking about the second area of focus (about the legal basis for the drone program), Stimson mentioned that a few official government documents have been made public that relate to the US lethal drone program, primarily through court orders. One was a redacted memo from the Department of Justice about the legality of the 2011 targeted killing of US citizen Anwar al-Awlaki « without due process of law, » following a successful ACLU-New York Times Freedom of Information Act request. The only other released document was the Department of Defense’s Law of War Manual, with three short sections on the use of « remotely piloted aircraft » in war. The only qualifications it contained was that the weapons cannot be « inherently indiscriminate » or « calculated to cause superfluous injury. » But the Geneva Conventions prohibit the targeting of civilians in all instances. Regarding the third area (about oversight and accountability), Stimson said the administration continues to oppose the release of any public information on the lethal drone program, which has obstructed mechanisms for greater oversight and accountability. « The lack of action reinforces the culture of secrecy surrounding the use of armed drones, » according to the report. 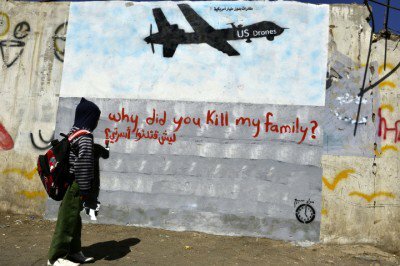 The Stimson report noted that the administration has « as a rule, been reluctant to publicly acknowledge the use of lethal force by unmanned aerial vehicles in foreign countries. » Stimson identified one « notable exception, » however. After the discovery that two Western civilians held by al-Qaeda were killed by a US drone strike in January 2015, the administration admitted the deaths, but provided few specific details. Former CIA director Michael Hayden mounted a full-throated defense of the US drone program in a February 2016 New York Times op-ed. He claimed, « The targeted killing program has been the most precise and effective application of firepower in the history of armed conflict, » annihilating the ranks of al-Qaeda. But his claims are impossible to verify without documentation. Hayden has also said, « We kill people based on metadata. » But Ars Technica recently revealed that the National Security Agency’s (NSA) SKYNET program, which uses an algorithm to gather metadata in order to identify and target terrorist suspects in Pakistan, Somalia and Afghanistan, would result in 99,000 false positives.